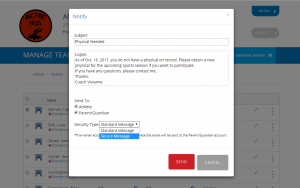 The new message functionality allows you to send standard and secure messages to parents and athletes. Standard messages displays the subject line in the mobile notification alerts and doesn’t require you to log into Privit Profile to review the message. Secure messages do not display any content from the message being sent and requires you to log into your Privit Profile account to view the message. Message Center this new area will allow you and your users to view standard and secure messages sent using PRIVIT. Leverage your mobile device’s notification center and receive alerts about messages you receive from your organization. For a How to Guide on sending notifications, click here. 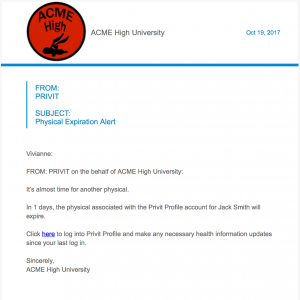 Easily remind your returning participants the physical they have on file is about to expire by sending an automatic notification to your participants and/or parents. The notification is based on the physical expiration date entered by administrators, from the Manage Teams page. You have the ability to configure how far in advance you want to remind your participants and/or parents and choose whether to use the default message or a customized message. Contact PRIVIT Support to have this feature turned on. You can elect to have the barcode functionality turned on. 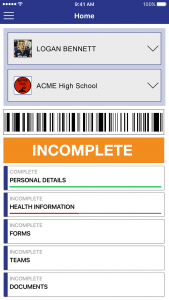 This paid feature allows you to generate a unique barcode for each athlete. 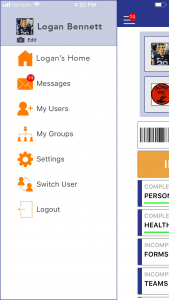 Only authorized users are able to scan these secure barcodes to complete another action. The actions available once a barcode is scanned are view an athlete’s emergency information, record a new incident, or check an athlete into an event. These barcodes can be leveraged in multiple ways providing authorized users another quick access point to athlete information. To learn more about this functionality, contact info@privit.com or call 855.977.4848 and speak with a PRIVIT sales representative. 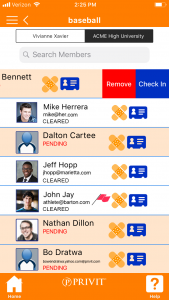 Easily remove an athlete from a team by swiping left and touching delete. The PRIVIT Sideline App is available for iOS and Android devices.